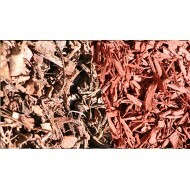 Pea straw is idea for vegtable patches, with its addition of nutrients to the soil and wat..
Red gum chips make a lovely finish to any garden for a decorative wow factor. This is a na.. This product come in one size and was originally made from chip but given a treatment of c.. This product comes in various sizes to give a diffrent look to the garden bed.Sizes includ..